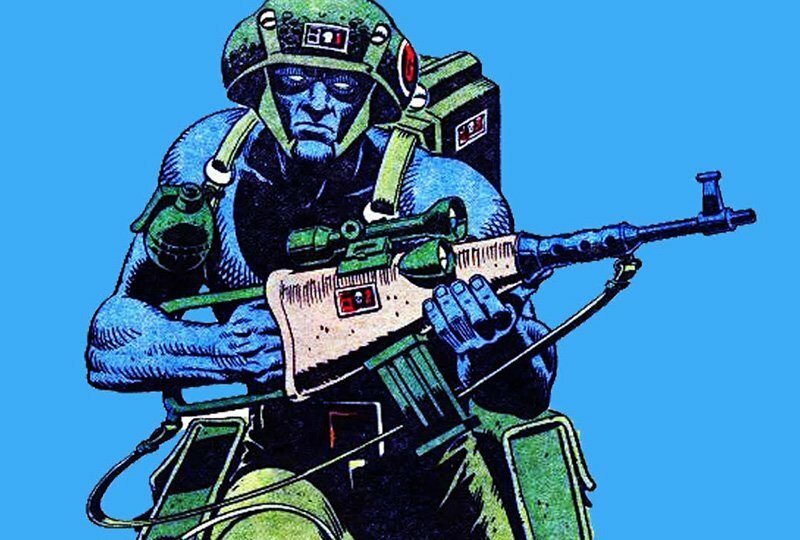 Sci-fi filmmaker Duncan Jones (Moon, Source Code, Warcraft) has revealed his next project is a Rogue Trooper movie, based on the sci-fi strip in the British comic “2000 AD,” created by Gerry Finley-Day and Dave Gibbons. RELATED: CS Interview: Duncan Jones Talks Mute, Warcraft and More! Incredibly excited to confirm I’m working on an adaption of Gerry Finley-Day & Dave Gibbons’ 2000AD comic ROGUE TROOPER! Rogue is a blue-skinned, genetically engineered elite soldier who searches for the Traitor General with his three comrades. His comrades are in the form of biochips on his rifle, backpack and helmet. Back in 2011, acclaimed comics writer Grant Morrison revealed his own plans to adapt Rogue Trooper for Sam Worthington’s company, Full Clip Productions. Are you excited about a Rogue Trooper movie from Duncan Jones? Let us know in the comments below!